Imagine a World without smokers! Well, a World without a bit of smoke is like a world without anything human in it. It is like a baby with no pacifier, like a world without fat and thin people, without tall and short, brunet or blond, like a WORLD WITHOUT HUMAN RACES. A world without smokers is a half of world. Why? Because almost half of it smokes. Instead of segregating people in smokers and non-smokers, we better concentrate on progress and how to improve our life! SMOKERS ASSOCIATION is an international non-profit organisation in support of human rights and, in particular, but not limited to, in defence of those who expect from life the freedom to smoke, drink, eat and to enjoy personal lifestyle choices without restrictions or interferences. Our community is equivalent to the International Smokers Club (ISC), having its locations, sites, restaurants, clubs, bars, hotels, halls, but not limited to, open as a whole and equally to smokers and non-smokers, without making any difference between them with the purpose of impose or forbid behaviours. There are many people in the world who are proud to be known as smokers. There are also others who will criticize smoking to a great extent. Actually it is everybody's choice to smoke or not. Smoking like any other leisure activity will lead the smoker to enjoying different aspects in his or her life. There are some countries in the world which put strict measures against smoking as a way of reducing the use of tobacco but other have realized that there is no need to put such strict measures and they are trying to be open to the opinion of smokers. There are some believes about smoking that make people prejudice smoking. The evidence that cigarette prices and adverts affect young smokers is terribly weak. The government needs to base policy on evidence, not dogma. Tobacco policy currently rests on two claims: tobacco advertising and promotion are the major reasons why young people begin to smoke; and young people are particularly sensitive to the price of cigarettes. From these two claims follow the central elements of tobacco policy, namely that all forms of tobacco advertising and promotion, including tobacco displays, should be banned, and tobacco should be heavily taxed in order to prevent or at least reduce under-age tobacco use. Unfortunately, neither of these claims nor policies meets the standards of evidence-based policymaking. Both are, instead, products of advocacy-based 'research' carried out by anti-tobacco lobby groups. In evidence-based policymaking, as in evidence-based clinical medicine, practices and decisions are based on rigorous, systematic reviews of 'best practice', that is, therapies and interventions that work the best in reducing morbidity and mortality. Evidence, and evidence alone, not theory or tradition, drives practice. Smokers are much more likely to develop lung cancer than non-smokers — that has been a scientific truism for decades. But what about the majority of smokers who don't develop lung cancer? Are they just the lucky ones? What about non-smokers who do develop the disease? New studies suggest that the lung cancer explanation may lie in genes. 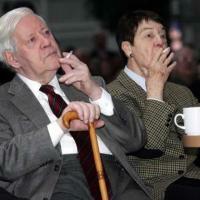 Helmut Schmidt, former German chancellor, former minister of defense and co-publisher of the influential weekly newspaper Die Zeit, was accused of breaking the law for violating Germany's new ban on smoking in public places.